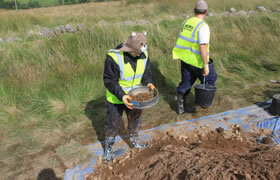 We are working with Forestry Commission Scotland to deliver community access and involvement with a research excavation of the early medieval boundary at Dalmellington, East Ayrshire known as Pickan's Dyke. The underlying archaeology project is the excavation of a series of trenches across the dyke to explore the origin, character and extent of this important early monument. This will enable the correct management regime for this monument to be developed to ensure its long term safety. While these works could have been delivered solely by the company, we have explored ways of engaging with the local community. Archaeologists on the project have presented sessions on archaeology and medieval Dalmellington to the local primary schools, which have followed this up with visits to our excavation. 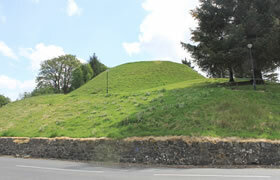 In addition, the timetable for the works was set to fall in Scottish Archaeology Month enabling the promotion of both an Open Day for the excavation and a short walking tour around the monument and other medieval sites in Dalmellington. 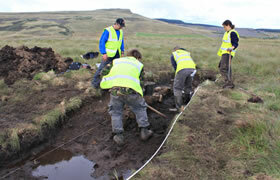 Volunteering opportunities were also offered to local residents who wanted to learn practical archaeology skills. Our work with Forestry Commission Scotland has delivered added value to their project and acted as a focus for engaging with the local community. The use of such added value initiatives using the Historic Environment as a resource also shows compliance with UK Forestry Standard for sustainable forestry. Archaeologists on the project have presented sessions on archaeology and medieval Dalmellington to the local primary schools, which have followed this up with visits to our excavation.